Whether a policymaker, practitioner, diplomat, or peacebuilder, the nexus of climate change, migration, and conflict is posing fundamental challenges in myriad ways. The Wilson Center’s study, Navigating Complexity: Climate, Migration, and Conflict in a Changing World, sets out to provide insights into these challenges and examine policy responses. Climate change is expected to contribute to the movements of people through a variety of means. At the same time, there is significant concern climate change may influence the form, type, and location of violent conflict. Our understanding of these dynamics is evolving quickly and sometimes producing surprising results. There are, in fact, considerable misconceptions about why people move, how many move, and what effects they have. While not exhaustive, the authors give a sense of the major lines of thinking and seek to help answer the following questions: What do we know (and not know) about the links between climate change, migration, and violent conflict? And what can be done to maximize the potential for constructive outcomes? Experts generally agree that the risk of violent conflict or instability related to climate change-induced migration is highly dependent on local context. Climatic factors are very difficult to separate from other critical factors in decisions to move or engage in armed conflict. These economic, political, and social factors will always be key parts of any analysis of climate change, migration, and conflict. Nevertheless, climate change and large movements of people clearly present major societal and governance challenges. Governments, international organizations, and civil society are being asked to respond, whether they are prepared or not. The report provides a background scan of relevant literature and an in-depth analysis of the high-profile cases of Darfur and Syria to discern policy-relevant lessons. 1) Labels such as “climate refugees” are misleading, given the current underdevelopment of legal frameworks defining these terms, lack of formal protections or status, and multiple causes of human mobility. 2) Because the vast majority of migration and displacement occurs within national borders, strengthening local institutions, including customary institutions, and encouraging flexibility in resource rights may help enable the peaceful accommodation of new arrivals. The primacy of resource rights also suggests the principles of environmental peacebuilding can help reduce vulnerability in areas prone to climate problems. 3) Conflicts where climate change and displacement play substantial roles may begin at the communal level but can quickly expand beyond. Related peace processes will therefore likely need to be carried out at multiple spatial and political levels. 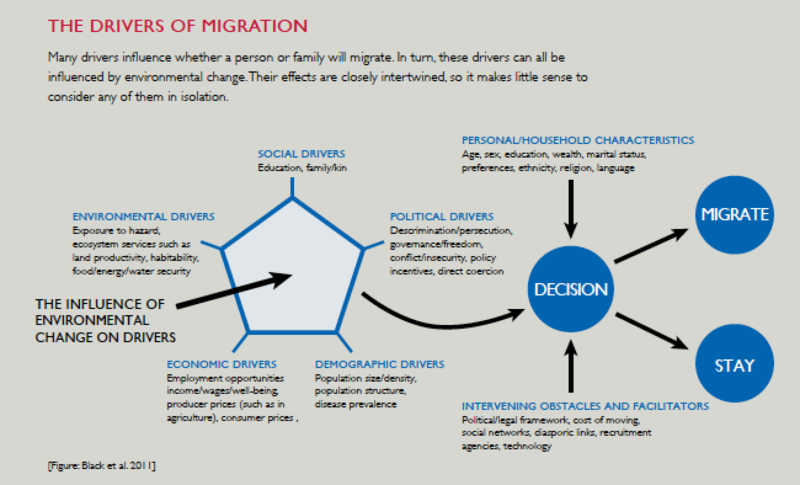 4) Movement in response to environmental change has a long history, and migration can be a successful and peaceful means of climate adaptation if enabled by smart policy. Although taking action is essential, simplistic analyses of climate’s impacts on migration, displacement, and conflict can prompt misdirected responses. Political, economic, and social contexts are as important to understanding vulnerability as exposure to the physical effects of climate change itself. 5) Some mechanisms for coping with climate change are tenuous and susceptible to policy change, as in the case of Darfur’s hakura land tenure system, which helped alleviate resource tensions before it was dismantled. Indeed, climate change responses can contribute to the displacement of people and social conflict. “Do no harm” should be the operating principle—though not “do nothing,” as people will adjust to their situation, regardless of how prepared the policy environment is, potentially turning to destructive responses if faced with few other options.